"An in ground or an above ground pool? "…...That is the question! 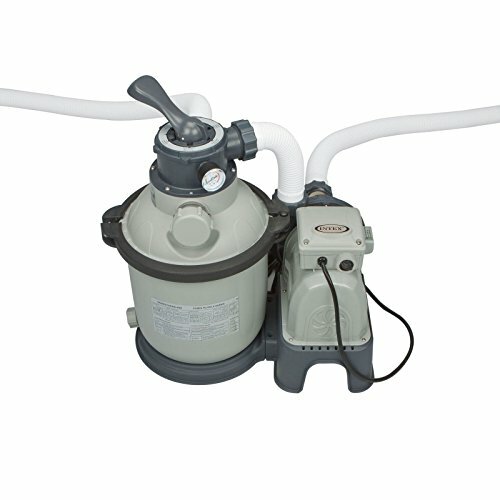 Intex Krystal Clear Cartridge Filter Pump for Above Ground Pools, (2500 GPH Pump Flow Rate, with GFCI). The Intex Krystal Clear 2150 GPH sand filter pump & saltwater system with E.C.O. (electro catalytic oxidation) is another good choice. With so many above ground pools pump and filter systems out there it can be difficult to choose the one that will do the job of keeping your pool’s water crystal clear. That is why in today’s post we want to expand on the different types of above ground pools filter systems, so you can make an informed decision on which one will meet your pool’s cleaning and sanitizing needs. Below you will find 8 of the best above ground pool filter and pump systems available, their features, and the advantages and disadvantages of each one. But first, let’s talk about above ground and in-ground swimming pools. Above ground swimming pools, as the names states it, are recreational pools that have all the components set on the ground. They are usually used in private residences and can be assembled and disassembled according to the season of the year, if you are moving houses, or if you no longer want a pool in your yard. On the other hand, in-ground swimming pools can be made of concrete, gunite, vynil and fiberglass, depending on the material, these can be custom-made and designed to your taste in a way that suits your yard the best. This decision has to take many factors into account: space, climate, and budget are the primary aspects to evaluate, and then there are aspects such as the use you want to give your pool. Will I be able to use the pool all year long? How big of a space does my yard have that I can use to install the pool? Is it merely recreational or do I want to be able to exercise in it? How my yard will change after installing the pool? Taking all these factors into consideration, we have gathered some information about both types of swimming pools. So, which are the main differences about in-ground and above ground swimming pools? Depending on why you want a pool in your home, you may have to go for an in-ground pool. The uses and activities that can be carried out in an above ground pool are restricted because of size and depth limitations. For example, diving heads first into an above ground pool can be quite dangerous and, if you want to practice swimming, an above ground pool would likely be too small for achieving a good work out. You need to take into consideration the size of your yard. Some yards may be too small or set in a way that makes it impossible to build and in-ground pool. In such a case, the solution is an above-ground pool, these come in various shapes and sizes that can easily adapt to your yard’s dimensions. Another thing to take into consideration is how decided you are on having a pool AND on staying in the house you currently own, why? Well, if you definitely think you have found your dream home, you can commit to building an in-ground pool. If you are not so sure you will be living in your current home for long, then an above ground pools is the best option. What is the point of investing time and money to then move to a new place? But then again, an in-ground pool would revalue your home’s net worth…this one is a point that needs to be thoroughly considered. Above ground pools can be as easily set up as they can be set apart, and you can take it with you to your new place in case you choose to move. Another big difference between these two types of pools is the price. Above ground pools are typically less expensive than their in-ground counterparts. To install an above ground pool, there are less construction requirements, materials, permits, etc. In-ground pools, on top of being more expensive to build and install, may also incur in property improvement taxes, unlike above ground pools. Both types of swimming pools need maintenance and incur in other costs, additional to construction or installation. These costs are associated to chemicals and equipment needed to keep the pool apt for swimming, and they are usually directly proportional to the swimming pool’s size. There is yet another important difference between above ground and in-ground swimming pools, and an important one at that. How they look, and how they make your yard look. A poorly set above ground pool can bring down the aesthetic value of your home, making it look unappealing and even depreciating the market value of your home. In-ground swimming pools, together with decking and landscaping work, can make your yard look stunning. Both in-ground and above ground swimming pools need filter and pumping systems to keep the water clean, free of debris, to prevent algae a buildup, and to maintain the right levels of chemicals so they can be safely used. Unlike their above ground counterpart, in-ground swimming pools usually have the filtering and pumping systems underground. If you decided you want to set an above ground swimming pool you should be careful when choosing the best filter system for above-ground swimming pools. You should consider different factors aside from the type of filter, such as the filter’s efficiency and endurance, and its maintenance needs. The most important thing is to make sure that the filter and pump system you decided on, fits the size of your above ground swimming pool, so the cleaning and clearing is done efficiently. You need to find the right balance between filter type and size, and pump power. Above ground pool pumps vary from 0.5 to 1.5 HP (horse power). If you choose a pump with excessive power relative to your pool’s size, it can create excess water movement, waste energy, making the electric bill soar and, in some cases, pose a safety threat. An above ground pool pump and filter system is easier to maintain: You just need to clean the filter every so often, and replace it when necessary. These types of systems use considerably less chemicals, which means you’ll spend less money one them in the long run. It is easier to repair if a failure arises because access to it is readily available, and most systems are open systems. Its effectiveness/cost ratio is excellent: Just because it is cheaper, it does not mean it will not do the job well, on the contrary, if you choose the right equipment for your pool size, an above ground pump and filter system will keep your swimming pool’s water clean and clear. and some of their benefits and drawbacks. Intex above ground pool cartridge filter systems will help you keep your pool’s water clean and refreshing and this one is no exception. 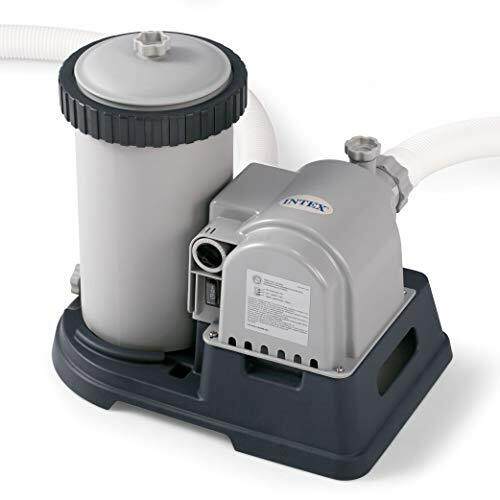 Intex Krystal Clear Cartridge Filter Pump for above ground pools has a flow rate of 2.5K gallons per hour. The water circulation and filtering of your above ground pool will keep the water clear, increasing its usability life span. 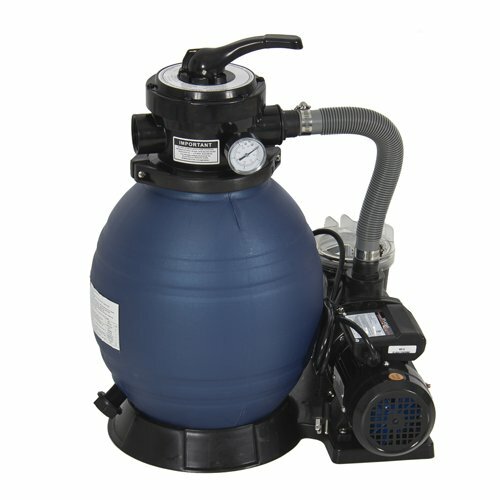 This particular cartridge filter pump was especially designed for above ground pools of up to 24 feet in diameter. It is easy to care for and maintain, only requiring a quarterly filter change. This model uses type B Intex filters. Additionally, it has a built-in timer that will let you set automated operating times to suit your schedule and a circuit interrupter to prevent short cuts or overloads. All Intex products go through extensive testing to ensure they meet international safety standards. This pump was designed to be connected to easy set pools, frame set pools, rectangular frame and ellipse oval pools from Intex, but it can also be used with pools of the same sizes and shapes from other manufacturers such Sand-n-Sun and Aqua-Leisure. This product has a size of 16 x 13.75 x 18.5 inches and it weighs 24.2 pounds. On the downside, some users have had problems when it is time to change the filter, reporting pump leaking once they have changed it, also, Intex customer care seems to be deficient. It is quieter than other models. It has a sediment valve at the bottom of the chamber where the filter is located, making maintenance easier. They say it can work with similar size pools of other brands, however, you may need to buy additional plumbing adapters to make it function properly. he filter is not easy to change. Buyers have complained about Intex customer service. 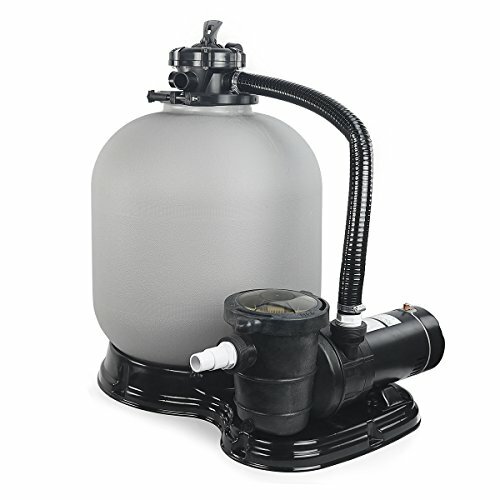 This above ground pool sand filter system​​​​​ has a control valve with six functions to filter, backwash, rinse, recirculate, drain and close the system, ensuring the cleanness and safety of your pool's water. It has a 24-hour timer that lets you set automated operating times and a safety override system which makes pool maintenance easier. The pump’s flow rate is 1.2K gallons per hour, so it is a good fit for any Intex above ground pool, especially for the 18 ft ultra-frame pool, the 24 x 12 ft ultra-frame rectangular pool and the 16 ft x 8" wood grain frame pool. This filter system is perfect for people who do not want to waste time with filter cartridge replacements. It does not require a great deal of maintenance as the sand only needs to be replaced every five years. The system has a size of 15" x 13.6" x 20.5" and weighs 22.8 pounds. The Intex sand filter pump is extremely efficient, cost-effective and it has been tested to meet UL/CSA standards and to comply with international safety standards. This sand filter system is very popular because it can pick up more of the small dirt particles and microorganisms floating around a pool. It includes GFCI electrical protection to prevent short circuits and system overload. It includes a strainer basket that helps extend the life of the sand and it is easy to clean. It is efficient and cost effective: the sand only needs to be replaced every five years. It does not come with the plunger valves and the 1.5-inch inlet/outlet fittings. Customers have complained about Intex’s helpdesk and customer service practices. If you are upgrading your pump filter, you need to beware. The plunger valves on the pool may not be suited for the increased water pressure from the new pump. This system is perf﻿ect for all soft-sided above ground pools. This system has a 20-gallons per minute pump and a convenient 4-function valve. 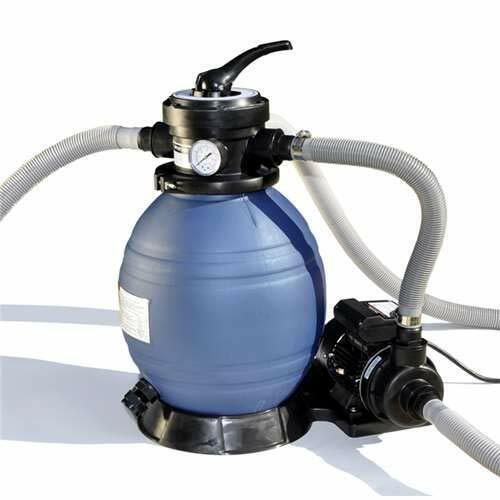 This product comes with all the necessary connections to set up your swimming pool’s pump and filtering system (hoses, nails, etc). The filter tank is resistant to hash weather and corrosion, it can fit a maximum of 42 pounds of sand. This above ground pump and filter system for soft-sided pools will keep you pool’s water clear and clean so you can use it for longer without having to change the water. It is easy to install and works with pools of up to 9.6K gallons. This system has a size of 21.8 x 12.8 x 16.5 inches, it weighs 22.4 pounds and it has a 1-year limited warranty. It is a good value pump and considering the price and the fact that the sand only needs to be replaced every 5 years, it seems like a good investment. The downside of this product is that you need to buy the sand separately and it does not come with an on/off switch incorporated to the timer. Additionally, some buyers have said that the instruction manual is not easy to understand. It is easy to install, taking only 10-15 min. It comes with all the necessary fitting to carry out the installation, such as hoses and nails. You will save time and money by not having to replace filters very often. The timer does not come with an automated on and off switch. It does not include the sand. It is difficult to get spare parts if one of the parts breaks down. Best choice products is one of the most popular above ground pool pump and filter systems manufacturer. The Pro 2400GPH 13 was conceived to adapt to most of today’s above ground pools and to become a low-cost maintenance choice to keep them clean and clear of any debris and sediment. This system has a powerful pump of 2.4 gallons per minute and a 4-functions valve. The sand bed is of high capacity which allows it to catch a higher amount of debris and to use extended filtering cycles. It is simple to install and easy to use and it will keep your pool in pristine condition. 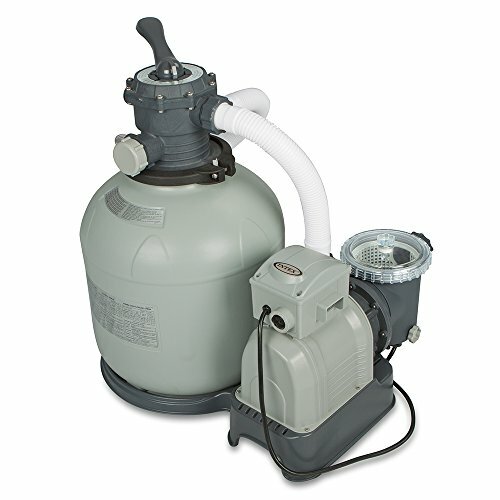 This sand filter pump system complies with CSA standards. It works with above ground pools of up to 10K gallons and it is a self-priming pump. The sand filter drum is 23.5”H x 13"W with a 13" sand filter of 42 pounds capacity. It has a size of 18.5 x 26.5 x 23.5 inches and weighs 26.2 pounds. The sand size is 0.018-0.022in, however, it does not come with the equipment, and it needs to be purchased separately. It comes with a strainer basket and the pump is protected against temperature. It is marked as ETL listed which means that the product has been independently tested and meets the applicable safety standard. The pump is thermal protected and the strainer basket is included. It has a high capacity sand bed. The sand does not come with the pump filter. According to some reviews, the pump overheats and shuts off. The warranty is too short (60 days). According so some reviews, it works well with small pools but does not keep dirt off the bottom of the pool. This Intex sand filter was especially designed for above ground pools. It combines, efficiency, economy and low maintenance. 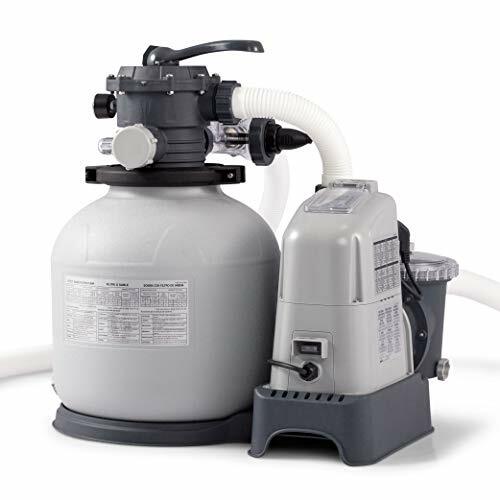 The sand filter pump can last up to three times longer than traditional cartridge filter pumps. You can save money on replacement filter cartridges every summer, as the sand in this filter only needs to be replaced every 5 years. The system has a 24-hour timer with 2 to 12-hour preset cycles to run an automated operation. It has a built-in GFCI (Ground Fault Circuit Interrupter) that will override and shut the system off in case there is an overload or short circuit. The system has six functions, this means you can filter, backwash, rinse, re-circulate, drain and close the system. The pump flow rate is 3K gallons per hour that results in a system flow 2,450 gallons per hour, this makes it ideal for 16 inches above ground pools and above. It works great with pools between 5.5K and 19.6K gallons. The entire system has a weight of 40.9 pounds and a size of 27.1 x 17.6 x 25.5 inches, the tanks size is 16 inches, and it has a sand capacity of 120 pounds. You can set up the 24-hour timer and forget about daily pool maintenance. It comes with a strainer basket to help cleaning and extend the usability of the sand. The sand only needs to be replaced every five years. Intex customer service care is not regarded as ideal. You may have to change the plunger valves if you are buying it to upgrade your current system. Some buyers have claimed that it shoots sand into the pool. This is one of the most efficient above ground swimming pool pump and filter systems, it has a simple installation method and it is easy to use. It will help you keep your water pool’s clean and free of debris. 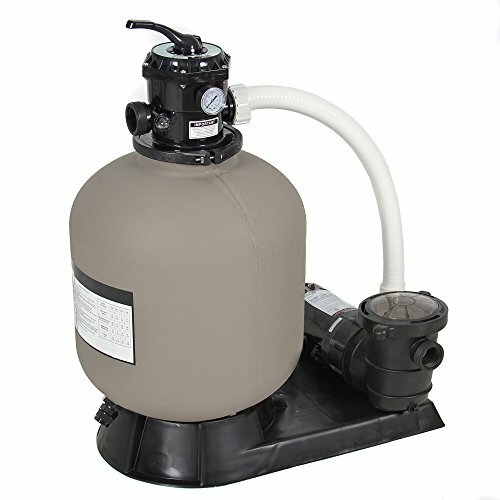 The filter itself, is a one-piece, blow-molded tank, set on a universal base that can be adapted to most pumps. It has a 6-position valve and a high capacity sand bed that helps catch more debris. It has a size of 29 x 19 x 37 inches and a weight of 35 pounds. The tank has a capacity for 175 pounds of sand, which is not included in the purchase. The pump, of 1 horse power, has a flow rate of 4.5K gallons per hour and it does not need priming. This system is recommended for pools of up to 18K gallons of water. The sand in the filter is easy to change and it is an efficient filter. On the downside, the hose clamps that come with the equipment are not very strong, and tend to brake during installation and it seems that it is not that easily adaptable to most hoses, this means that you may need to buy additional fittings or adapters to be able to install it, depending on your pool's original parts. The filter has a universal base that can adapt to most pumps. It is an efficient filter and easy to clean. It has a self-priming pump. The directions for putting it together are note very clear. The hose clamps that come with the equipment are weak. You may need to buy additional fittings or adapters. This above ground pool pump and sand filter system is equipped with a 1.0 horse power pump and a 175 pounds sand capacity filter. The filter tank is built with heavy duty thermoplastic that is strong and resistant to corrosion, its characteristics ensure this is a long-lasting piece of equipment. At the top of the tank, sits the 6-function, multi-port valve that ensures all cleaning and filtering is done properly. It has a sand bed designed for optimum filtering performance, effective backwashing and to help prolong filter cycles. This above ground pool filter and pump setup has an area requirement of 29"in length, 19" depth, and 37" in height. It is easy to install and easy (and cost-effective) to care for, making it a simple solution to keep your pool s water clean and clear of any debris or sediment. The entire equipment weighs 56.8 pounds and is independently tested (ELT), UL listed and CSA certified, this means that it complies with the U.S. and Canada’s safety standards. It includes a hose and clamp and a PCV mounting base. It is recommended to be used with pools of up to 18K gallons, the pump is 1 horse power, and self-priming and it has a flow rate of 4.5 gallons per hour. The downside to this pump is that it does not have a timer, so it has to be turned on and off manually, or you need to purchase a timer to adapt it, also, it does not have a safety override method. The design ensures that pool water is exposed to the maximum sand surface area, optimizing the filtration process and extending filter cycles. It is a cost-effective durable option. You may need additional fittings, depending on your pool system. It does not have a timer. Sand is not included in the purchase. This above ground pools sand filter pump & saltwater system with electro catalytic oxidation (E.C.O.) by Intex combines the best of two excellent systems in one to keep your pool’s water crystal clear and safe, providing a low cost alternative to pool maintenance and care. This filtering system will eliminate bacteria, oxidize bather organics and control algae. It comes with a 24-hour timer to control automatically both. The dual system was designed to work with pools with a capacity between 4.8K and 15K gallons. It has a ground fault circuit interrupter (CFGI) to prevent the system from overloading and to avoid accidents in case of a short circuit. The pump flow rate is 2,650 gallons per hour, while the system flow rate is 2,150 gallons per hour. It has a sand capacity of 100 pounds or of 70 pounds glass filtration media. The chlorine output is 11 grams per hour. The whole system has a size of 28.2 x 16.6 x 27.1 inches and a weight of 52.1 pounds. The downside of the above ground pools sand filter pump & saltwater system is that you may have to buy additional fitting depending on your pool connection system, and that buyers have repeatedly reported leaking problems. CFGI to prevent the system from overloading. May have to buy additional fittings. Factors such as the cost of maintenance and the time spent carrying it out, budget, and pool size, are all things you need to evaluate when choosing the best filter system for above ground pool. You want to make sure the water in your pool remains clean, clear and safe to use. For standard size, aboveground swimming pools, a 1 horse power pump works perfect in keeping the water clean. There are a wide range of options out there and the list of items presented are, in each own, one of best above ground pool filter system available in the market. Taking that into consideration, the first and last of the list are excellent choices. It as an override system that will shut the whole system off in case there is an overload or a short circuit, this is an excellent safety measure that guarantees no electrical mishaps. It is quieter than other models. Pumps can be quite loud and if you are having a pool party, you surely want your guests to be able to talk without having to yell at each other. It also has a built-in timer, which means you do not have to worry about turning the system on and off. You can just set it according to your pool’s cleaning needs. It is also on the lower end of the price spectrum. Even though it is on the more expensive side of the price spectrum, the fact that it combines sand filtering and electro catalytic oxidation is a huge selling point. Electro catalytic oxidation is an advanced oxidation process that consists of a direct current being applied to electrodes. This causes hydroxyl radicals to be produced. These radicals, in turn, will oxidize organic pollutants, destroying bacteria and algae. This hydroxyl combined with available chlorine are the most efficient way of pool water sanitation. On top of that is environmentally friendly, what else could you ask for? Of course, in the end, it all comes to your preferences, needs, and budget. We hope you found this information useful and that it can help you make the best decision for your above ground pool pump and filter system. Are you ready to get the best above ground pool pump and filter to keep your pool crystal clear?